FMG partners with the alumni/ae, parent & undergraduate leaders in developing a strategy to update & maintain records that meets the chapters needs & budget. 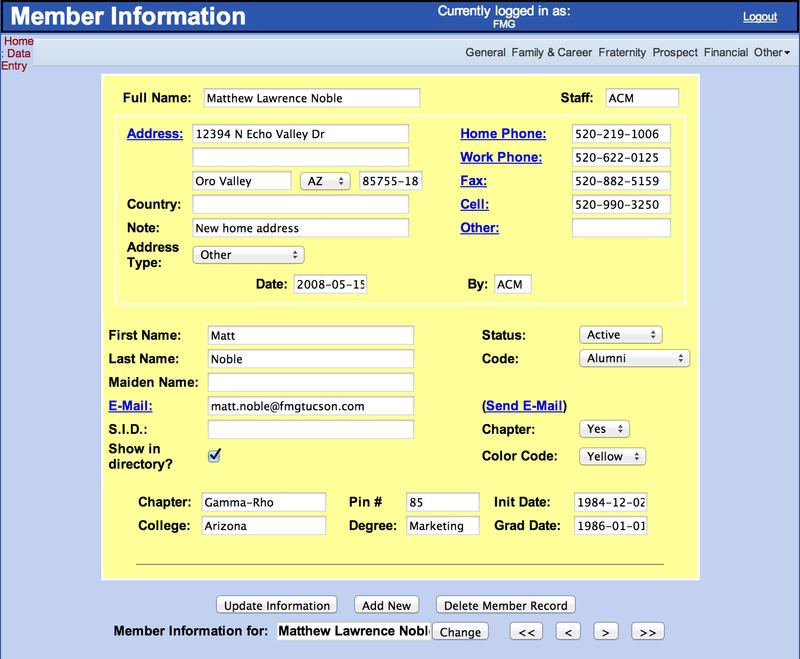 FMG has custom software that enables both FMG staff & our main contacts access to the database. We track the following information at a minimum: name, initiation year, graduation year, address, email, home phone, work phone, cell phone, fax, employer & title, spouse, volunteer positions, officer/committee chair positions, event attendance & payments, contributions & contacts. Our database directly links with websites that we manage so the data in both are current within the hour. To learn more about how FMG can manage the alumni/ae, parent and undergraduate data for your chapter, please contact Matt Noble at matt.noble@fmgtucson.com or 520-990-3250.